Today I'm sharing the Valentines Cards made in this month's class. This will be my last class for the next month or two until I'm back on track. I can't believe how quickly time has gone! I'm due in 3.5 weeks!!! Here are the sample cards I made up for the class using the Sealed with Love Bundle from Stampin' Up! which I have paired with the Whisper White Note Cards & Envelopes. I absolutely adore how this set came out! 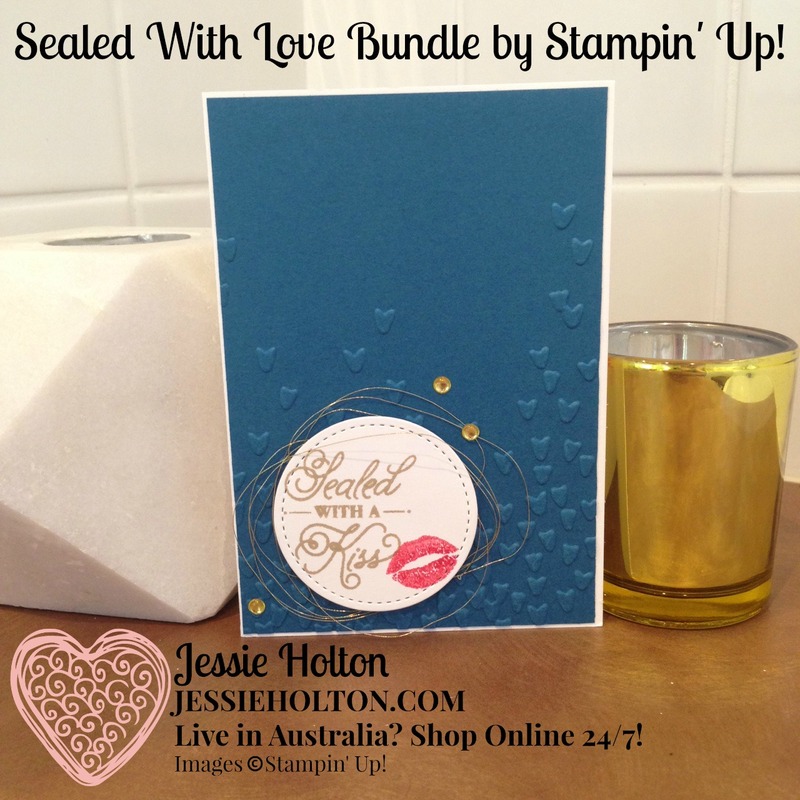 And as my new team member, Amy, pointed out, there are tons of uses for this bundle. You can send love for many different reasons, not just Valentines... to offer sympathy over the loss of a family member, friend or pet & she had some really cute baby card ideas too! 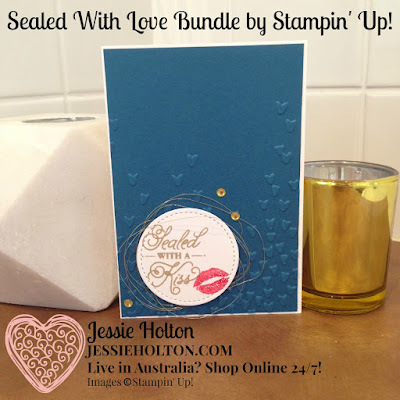 For this first card, I have layered the card with the Sending Love Designer Series Paper (DSP) Stack & then cut the side off with the hearts edgelit from the Love Notes Framelits. I have then Gold heat embossed one side of the Lace Doily & sponged the other side with Peekaboo Peach before adhering it to the card with some Tombow Multipurpose Liquid Glue. I stamped the Versamark directly onto the Lace Doily really quickly, as I wanted the Gold emboss to be quite textured, but you could create a more covered look by stamping longer/harder or swiping off. 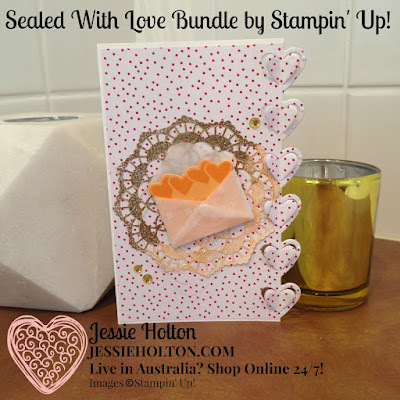 I've stamped the hearts & sentiments from the Sealed with Love stamp set in Peekaboo Peach cardstock & ink, & I have used the Sending Love Glassine Sheets for the little envelope, using the Love Notes Framelits. Aren't they just adorable!! I have also added some Gold Metallic Thread under the envelope, which I've attached with Dimensionals & some little Gold Enamel Shapes. The next card I have for you is using up a bunch of scraps, it looks like a patchwork quilt. This is the first time I have tried this kind of card & it was a great way to use up the side bits you're left with after you make a card front from the 6x6" DSP stacks. 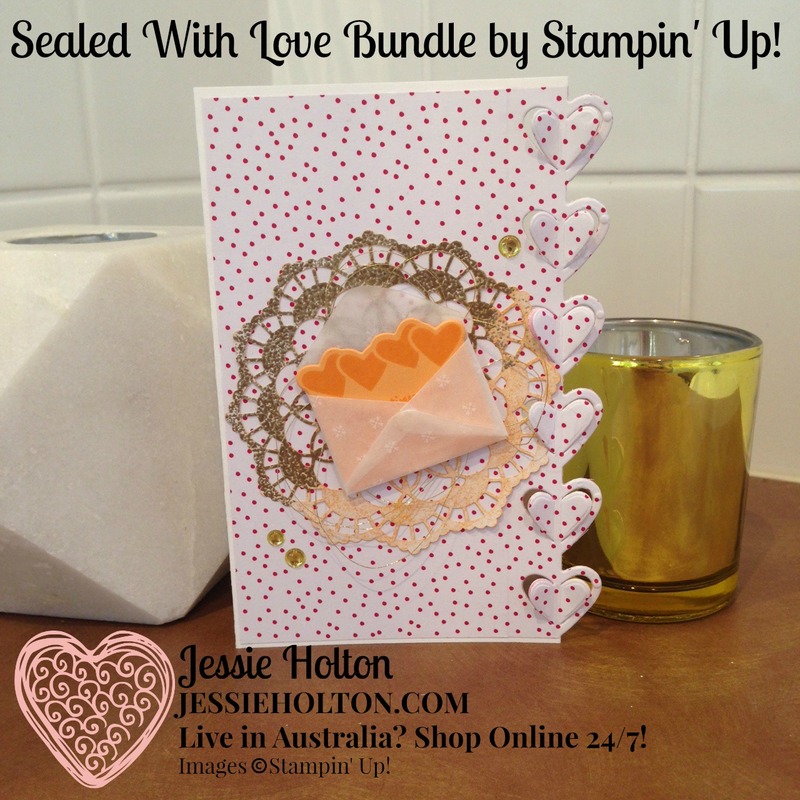 I have used a bunch of offcuts of the Sending Love DSP to make 1" squares, which I've then arranged on a Peekaboo Peach cardstock. 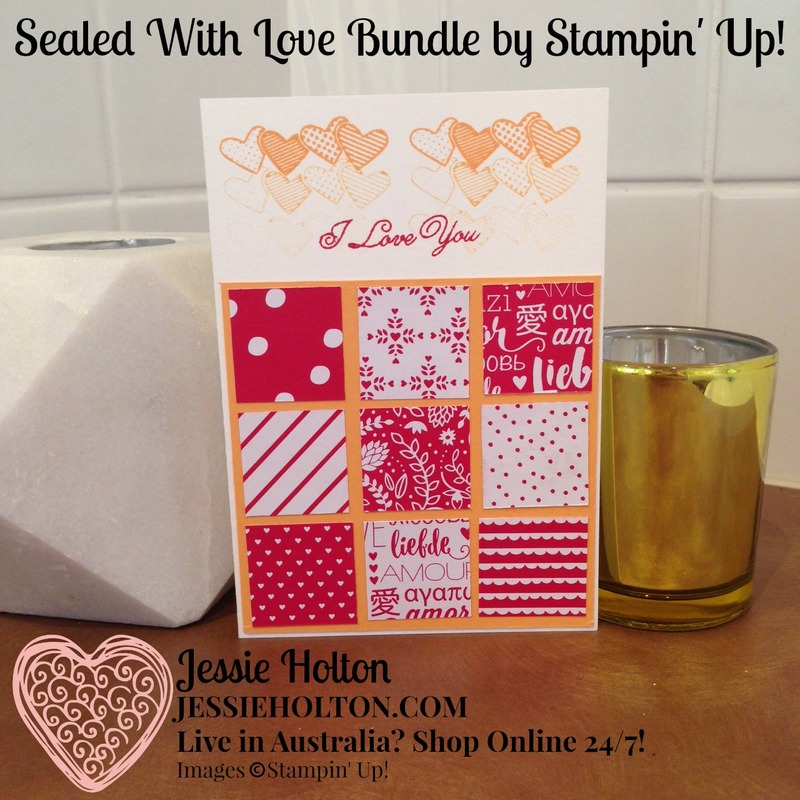 I've then stamped the hearts & sentiment from the Sealed with Love stamp set in Peekaboo Peach & Real Red. Lastly, I have used the Falling Petals embossing folder with Dapper Denim cardstock layered with a little circle cut from the Stitched Shapes framelits on Whisper White cardstock. I've stamped the sentiment in Crumb Cake & the lips in Real Red (stamped off) & added a nest of Gold Metallic Thread & a couple of Gold Enamel Shapes. 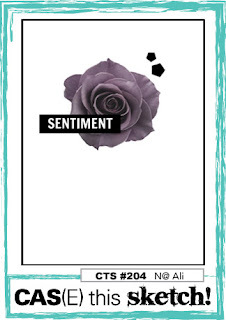 I love how with a simple layout flip or change of DSP, you can make a completely different card. I left the girls to decorate the insides as they wished or leave blank for a different occasion. The girls have said they wanted to use the cards for Valentines, Anniversaries & Weddings & I'm sure the recipients will love their cards!